View More In Harnesses & Leashes. BabyKim Airplane Harness aviation travel safety harness provide you with a simple and effective way to ensure your child's safety when travelling by airplane. 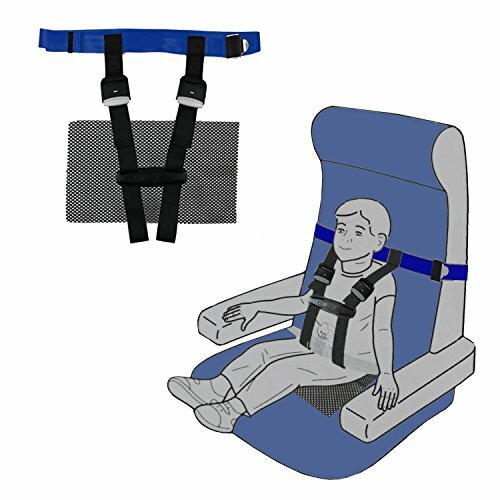 [Install]Simply slip the blue/orange strap over the back of the airplane seat and connect the two black straps to the existing airplane seat belt. BabyKim Airplane Harness will fit any airplane seat, and can be installed in one minute. - Children will not slide out of the seat when landing or boarding. Adjustable Care Harness: Airplane harness straps can be adjusted accordings to the hight of your kid/child/toddler(1 year and older weighing 22 to 44 pounds and up to 40 inch tall【approx 1-5 years】）which can secure your baby while traveling by plane,and will not put pressure on child.. BabyKim's aviation harness fits almost every size airplane seat. Anti-skid Cushion:Keep away from choking hazard. Using non slip mat to prevent toddlers slip out of the seat when flight takeoff and landing.Keep your child from slipping down and sliding out, especially when your kid falls into deep sleep. If you have any questions about this product by BabyKim, contact us by completing and submitting the form below. If you are looking for a specif part number, please include it with your message.